Instructions for adding a logo on your website. If your community has a logo you would like to use to display the community's name, full administrators can add this from the "Settings" section in the Admin Control Panel! In the "Settings" section, click on the "Appearance" tab and then the "Header" tab. 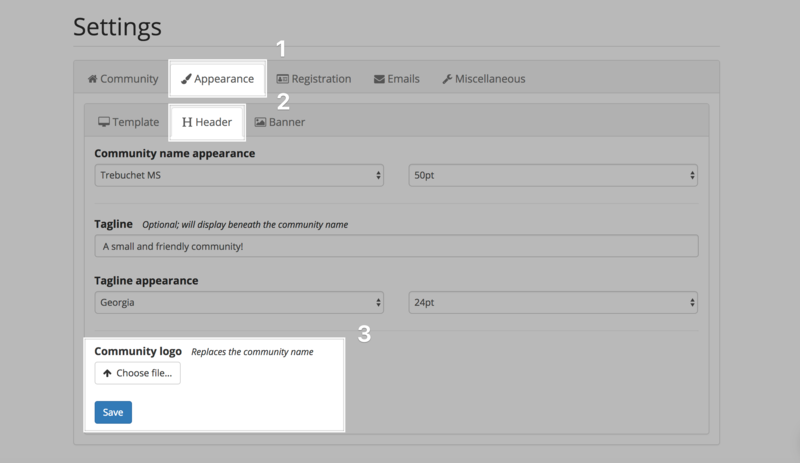 Next, under "Community logo" click on the "Choose file..." button. From here, browse your computer for the logo you'd like to use and click "Open." You will then see the file name appear next to the "Choose file..." button. Lastly, click "Save."